There’s nothing more warming and comforting than a bowl of soup as the weather starts to cool. 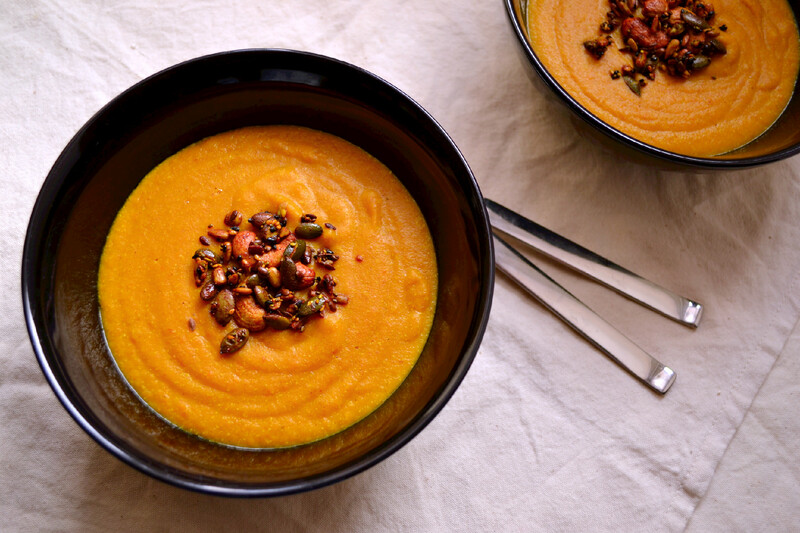 Soups are an incredibly easy way to make a healthy, delicious and nutritious weeknight meal. They make great leftovers, they freeze well and pair beautifully with a sandwich. This soup was a spur of the moment concoction and turned out fantastic on the first try. I’ve made it a few times since to make sure I had the measurements right for the recipe, and it has never let me down. It’s really simple with few ingredients, but the end result is a soup full of body and flavour. It’s quick and easy to make, even on a weeknight, and incredibly warming and satisfying. The hero in this soup is the carrots. 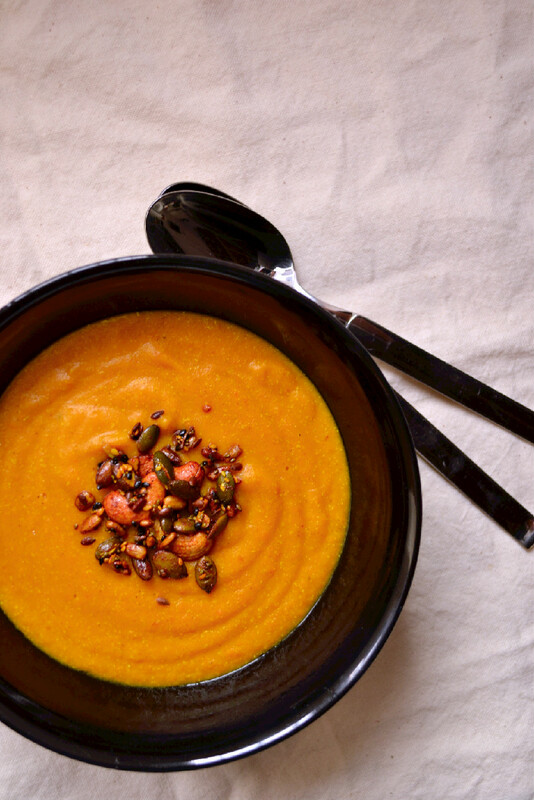 They’re cooked down with onions, coconut oil, creamy coconut milk, water, mild curry powder and millet, puréed into a velvety soup and topped with crunchy maple turmeric roasted seeds and cashews. I made it Friday and had the last bit of leftovers for lunch today and it was just as good if not better than the day it was made. Carrots are loaded with the goodness of vitamin A (like beta carotene), vitamin K, and fiber among other nutrients. They’re great for the eyes, the skin, the digestive system and general overall health. They’re naturally sweet and flavorful and lend themselves well in many preparations from raw to cooked, salads to soups, stir fries and even baked goods. The addition of millet to this soup pumps up the plant based protein content and adds to the rich texture. Millet is extremely versatile with a delicate flavour, making it a blank canvas for almost anything, from this soup right here to this millet pudding parfait. 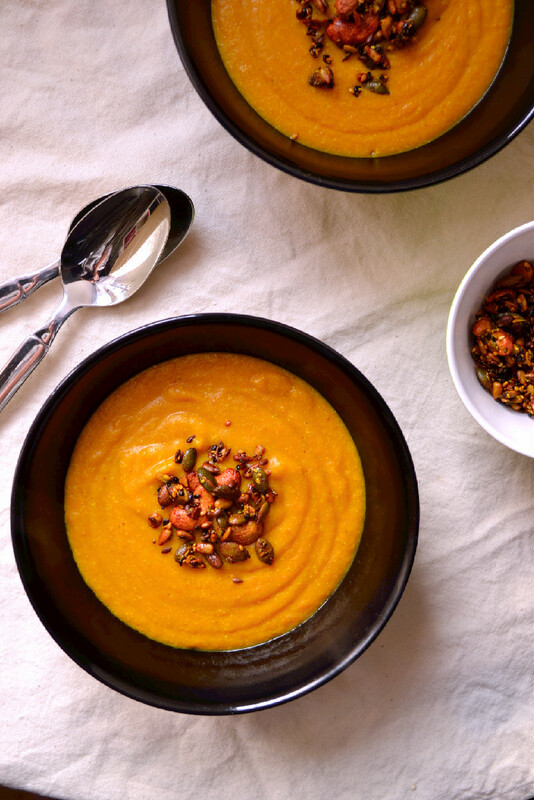 The curry spice mix adds warmth and flavour to this soup and a good dose of anti-inflammatory immune boosting antioxidants from the turmeric. The maple turmeric roasted seeds and cashews add a pleasant crunch, plant based omega-3’s, and a healthy does of fat. Slice onion in half and then into half moons. Thoroughly wash, scrub and slice the carrots into medallions. I didn’t peel the carrots, as I wanted to maximize the nutrient density of the soup. If you don’t use organic carrots, then it’s better to peel them first. Add coconut oil, if using, to a pot and let it melt. Once coconut oil is melted, add onions and sea salt and sauté until softened, about 3-5 minutes. For oil free option sautée the onions in a small amount of water. Stir in the carrots, add coconut milk and water and bring to a boil. Stir in curry powder and millet, reduce heat to minimum, cover and simmer about 25-30 minutes, stirring occasionally, until carrots are softened and millet is fully cooked and puffed up. Remove from heat and let cool for a few minutes so that it’s not boiling anymore, then purée with an immersion blender to a creamy velvety consistency. If you don’t have an immersion blender, you could always transfer the soup to a stand blender or food processor and blend it that way, but my preference is the immersion blender as you don’t lose any of the soup in the transfer process. Pour into serving bowls, top with roasted seeds and cashews and serve hot.